Singular Forms installation view at the Guggenheim in New York. Today marks the last day of the James Turrell exhibition at the Guggenheim in New York, and we want to give our viewers who were not able to attend the exhibit a look into Turrell's intricate and unparalleled light installations that not only deceive the untrained eye, but have also transformed the famous structure of the museum, something that is very rarely done. Turrell describes his work as art that's allowing you to "see yourself seeing," a reflexive state in which one becomes aware of the function of one's senses and light becomes a tangible substance. 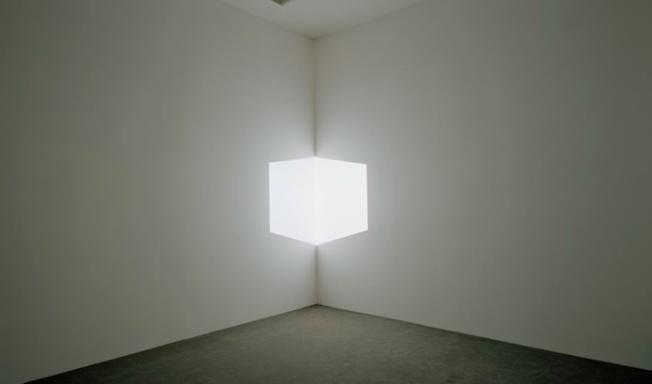 In the photo above, Afrum I (White), a floating cube appears to be a solid object, but upon standing in the pitch-black room for some time, you realize that it is a projection of planes of light onto a wall. The artist takes Frank Lloyd Wright's helical architecture of the Guggenheim and re-imagines it by transforming the rotunda into a LED light installation, creating fixtures that form concentric ellipses of color and light. It is an exhibit that will make one question one's senses and find profound revelations of light and space--a must see! If you missed the exhibit at the Guggenheim, the "James Turrell: A Retrospective" exhibition is running at LACMA through April 6, 2014.